Though many may be aware that forages and livestock have a direct relationship, few really grasp the role of forages in sustaining the environment. Because grasses, legumes, shrubs, and forbs are around us every day we rarely look closely into the many jobs they do. And as forages are better managed, they are being utilized in more ways. Forages are fuel for animals, but they give back to the earth many beneficial things. A corn crop requires more nitrogen, herbicides, and pesticides than forages and depletes and erodes the soil to yield its fruit once a year. 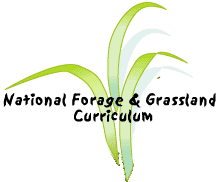 Forages can give repeated harvests each year, give nitrogen back to the soil, prevent erosion, filter water and clean the air, absorb impurities, and be used for medicines and biofuels. Scientists have found new ways to integrate forages into other businesses. Some use forages in livestock/wildflife production while others are using the environmental benefits of forages while managing forests (agroforestry). The World Commission on Environment and Development in 1987 called for sustainable development to "meet the needs of the present generation without compromising the ability of future generations to meet their needs." Sustaining the land, plants, and animals is the whole function of forages. They give so much more than they take. The agricultural heartland of America is the result of years of natural grasses and legumes giving to the soil.